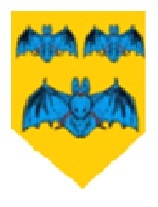 Upon its establishment in 1889 the Brecknockshire County Council adopted the attributed arms of Brychan but never obtained an official grant of armorial bearings. In adopting these legendary arms, albeit informally, the council asserted a linkage between the early kingdom and the later county and highlighted the historical significance of the founding father Brychan. The symbols used clearly being felt to be appropriate and locally meaningful. Accordingly, the proposed flag reworks the essential and more distinctive elements found in the arms. therefore features the three colours of black, gold and “cerulean” blue. 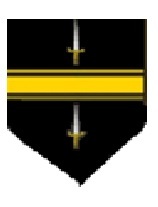 The black features as the main field colour, upon this is a cotised gold stripe i.e. a stripe with two smaller ones above and beneath, as found in the arms of Brychan, which is felt to be a particularly elegant and pleasing arrangement. Across the cotised gold stripe is placed the silhouette of a bat with outstretched wings in the blue shade. This entry was posted in Brecknockshire. Bookmark the permalink.